Why I'm switching to FireFox! I made a tough decision today. But sometimes you have to bite the bullet. MS Internet Explorer has been annoying me for a variety of reasons as of late. While I like its interface, its performance was awful. I decided to switch to Explorer 8 Beta to see if it worked better, but it most definitely did not, so I switched back to IE7 and that's when the freezing started. What causes it, I don't know, but some part of the IE8 uninstall screwed things up, so IE7 now freezes on a regular basis. I didn't want to move to Firefox, because while FF seems to perform better, it's interface was annoying. But today I downloaded FireFox 3. The visual improvements are minor, but those minor improvements are significant for the overall experience. My Bookmarks didn't migrate well, but I'll eventually fix that manually. In the meantime we'll see how this migration goes. 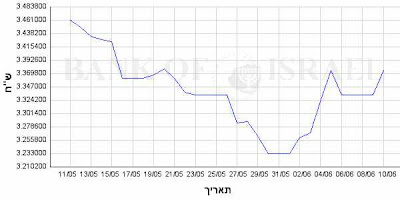 So how many of you realized that a whole bunch of Israeli companies are on strike right now? While everyone talks about the upcoming exchange of live terrorists and mass murderers in exchange for the bodies of our kidnapped soldiers isn't it time we changed the focus of the discussion? For 2 years we've known nothing about our kidnapped soldiers and they are presumed dead. If these are to be the rules of the game, then this should be the rule for all. It's time that we stopped letting terrorists have visitors, be they family or the Red Cross. In fact no "signs of life" should be released at all regarding their condition. Perhaps going as far as denying we even have them. If our soldiers are returned dead, then so should the terrorists we are exchanging for them, even if they are alive now. And if we don't have enough terrorists to exchange, then a Sayeret Matkal unit should be sent in to retrieve some high ranking ones. It's about time that Israel acknowledged and accepted that we must play by the rules of the neighborhood surrounding us. Otherwise this cycle of Kidnap and Release will never end. Remember that line? We used to hear it a lot when Arafat was around. The government used to excuse the attacks coming from PA occupied territory with that line. In hindsight, except for the most diehard leftwing fanatics, we all know now (what the Right knew even then), was that Arafat and the PA were behind those attacks, outsourcing them to “splinter groups” and the like in order to maintain a not so credible deniability. So while the Israeli government purposely lied to itself (and to the People of Israel), Arafat was handing envelopes of cash (sound familiar) to his surrogate terrorists and their families who were "keeping up the struggle". And the Israeli government has to support that fiction. The entire legitimacy of their “Peace Process” demanded it of them. And Arafat knew that oh so well. And now we’re back there yet again. The government needs to maintain the fiction of the latest truce so that it doesn’t need to commit to the military option. While Hamas has no plans to really stop the attack on Israel – that is its raison d’être, after all. So one side of Hamas’s mouth says that the Kassam attacks are bad for the Palestinians at this specific moment and they should stop, the other side of the same mouth says that Hamas has no intention of being the Israeli police force and stopping the "independent" rocket launches. And so the rockets continue to fall, and so Israel continues to not respond. Shimon Peres may not want to learn from history, but even the Israelis with the shortest of memories must remember that we in this same exact game not so long before. Postscript: Israel is actually transferring funds to Hamas in Gaza. Israel claims it is transferring funds to the PA in Gaza, but there is not PA in Gaza, only Hamas. Another useful fiction. I still haven’t weighed in recently on the conversion issue. But there has been some discussions lately about the Messianics, and if they should be allowed entry and citizenship as Jews or not. There is no question that the Jewish citizens of Israel must be protected from their propaganda and missionizing. I think one of the primary flaws of the Law of Return was that it didn’t properly answer the issue it was trying to address. The mistake was in not creating two tiers for entry into Israel. 2) Automatic Refugee Entry for those persecuted because of a Jewish familial connection. It wouldn’t resolve the Messianics question, but I suspect it would have changed the demographics of who was let in, and who ended up staying from the former USSR. Certainly the neo-Nazis with their questionably Jewish relative in their history wouldn’t be walking around the Holy Land today if the law was properly written. And we wouldn't have supposedly Jewish IDF soldiers asking to swear in on New Testaments. There is nothing like the People of Israel! Israeli scientists have created a vaccination against the skin cancer "melanoma". Melanoma is a relatively rare cancer, but it is the leading skin cancer that causes death. The vaccine, developed by Prof. Tamar Peretz and Dr. Michal Lotem at the Oncology Institute of the Hadassa Medical Center in Jerusalem, helps prevent the recurrence of the cancer and increase the chances of survival for current victims. That's two major medical announcements in the space of week from Israel. Yossi Shwartz is a man with nothing. Once he was a farmer in Gush Katif (Gan Or). Yossi had a home, had land, had a job, and had employees. And then the Israeli government ripped it all away. And now he finds himself in an even stranger situation. A few months after the Expulsion, Yossi found himself sued by 17 of his former Arab employees. They are demanding severance pay from him. Now while Yossi might agree that his former employees deserve severance pay, he doesn’t feel he is the right address for his former employees. After all, he wasn’t the one that shut down his farm and fired his employees. That was a decision and act of the Israeli government, and just like they still owe him fair value for what they destroyed perhaps they owe the same to his workers. So Yossi went to Minhelet Sela (The Expulsion Authority) and demanded they provide him with legal counsel to defend himself. They of course refused. Their official response is that as an employer he was responsible for setting aside money for severance pay and he should pay them from that. (Note that he still hasn’t received from Minhelet Sela what is due to him by law). Eventually he found his way to the organization “Ezri” which was able to provide him money for legal counsel in the form of the lawyer Neil Samulet. The suspicion raised is that this is a trial balloon (perhaps run and financed by Israeli left-wing organizations?) to see if all the former Arab employees can start suing the former Gush Katif farmers. The lawyer case’s is simply that the workers must sue the State not Yossi. The case went to court and the court agreed that the Yossi is not the party that is responsible to pay their severance pay (though Yossi still had to pay, with Ezri's help, the tens of thousands of his legal defense fees). These same Gaza Arabs are now trying to get at Yossi in another court, clearly implying that there is some serious local left-wing assistance going on here, specifically targeting the Gush Katif farmer, as they know the system so well and specifically didn't go after the government instead. It was also recently exposed that the Israeli government property assessors received explicit orders on how much to evaluate the homes in Gush Katif. The first 100 homes were accessed properly, and when the senior government officials saw that the actual value of the homes in Gush Katif were easily hundreds of shekels higher than what they had planned for, they gave orders that all homes were to be accessed at a lower fixed rate - which is the way it was done from then on. I have always found the concept of prayer to be an extremely difficult one. What does it do? What is it for? Who is it for? Does it work? And if it works, what does that actually mean that it worked? And does God actually need our prayers? Obviously there are different kinds of prayers. The most common are prayers of thanks and prayers of supplication. Another kind is a little more subtle, it involves keeping pre-Destruction rituals in our collective memory (Karbanos), and of course there is the kind that is there to remind us what our collective (and personal) mission in this world is (Aleinu). Yet even with the prayers of supplication, what is the goal? What are you praying for if the situation seems hopeless? A miracle? Yet miracles don’t seem to openly happen every day. Yet we continue to pray. And what happens if the prayer goes unanswered? In Jewish thought, there seems to be no such thing as an unanswered prayer. A prayer may not be immediately answered, answered the way you wanted, or answered at all, but prayers seems to be something fungible. They are saved up and if not applied to this case they are applied to something else. Western Wall Prayers is offering to be your agent for 40 days of prayer at the Kotel. As I mentioned on Jameel’s site, my wife is a very big believer in 40 days of prayer (and if fact she prayed for 40 days before she met me, and then prayed again for 40 days (quite a few times, in fact) for us to get engaged). I haven’t actually found the source for the 40 days, but I believe I found the source for praying at the Kotel. Psalm 20 is a very interesting psalm dealing with prayers of supplication. But one particular lines seems to answer part of the mystery. Thus the origin of praying at the Kotel (the closest we can normally get to Har HaBayit) the Dispatch Center of the blessings as indicated by the line. I’m still looking for the origins of repeating the request for 40 days, so if anyone thinks they have a good answer I’d like to hear it. In the meantime, if you have some special prayer for God (such as finding a spouse, improved financial situation, health, etc.) that you’d like prayed for you at the Kotel for 40 days, then you should contact Western Wall Prayers. (And if you need someone to say Kaddish every day for someone that passed away, they offer that service too). Before I say anything further, I want to make something clear, I am not condoning this behavior, I am not promoting this behavior, I am not recommending this behavior. I am merely pointing out that certain creative financial activities will soon be possible that weren’t possible before, and some people are going to take advantage of it. 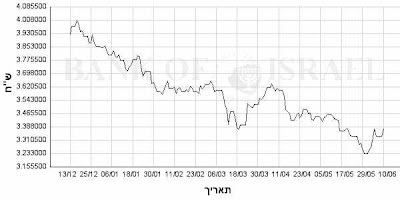 Very soon there will be a new tax law in Israel for Olim who made Aliyah after January 1, 2008, unless someone stops it in its tracks (which doesn't seem likely at the moment). The new law exempts the Olim, not just from paying taxes on ALL foreign (non Israeli) income (passive and active), but the law does not even require the new Oleh to even REPORT this income!!! This creates some interesting possibilities in creative accounting. For instance the Oleh can work for a US company they set up and own. The company can have a contract with an Israeli company for services. The Israeli company can pay the US company. They US company pays the Oleh everything as salary. Since the Oleh is living in Israel, up to a significantly large enough amount of salary/revenue is exempt from US taxes (except perhaps Social Security on the salary), and due to the new law he would be exempt from all Israeli taxes on his US salary . I'm not an accountant, but it might make more sense for him to take the salary as dividends and then avoid the Social Security entirely. The more creative Oleh is going to perhaps discover even more interesting and profitable ideas, which to be honest, I’m not going to even dare to post here. And finally, the extremely creative Oleh is going to soon realize that his new best friend will be an extremely creative Israeli. I’d like to thank Nefesh B’Nefesh for sharing this information. What a shame I already made Aliyah. For years, Egypt has been looking for ways to bypass the armistice peace treaty and brings it troops across the Sinai and amass them directly on Israel's border. It looks like they’ve managed to do it one better. This corrupt, idiotic Israeli government is talking about bring a “multinational Arab force” into Gaza, based on the recommendations of the Egyptians. This translates into massive Egyptian troops stationed within the Land of Israel, their wildest dreams come true. If that doesn’t sound so bad to you, then consider that every major training exercise the Egyptian army undertakes (with US supplied weaponry) is pretty much with an unnamed enemy that happens to have the same GPS locations as the State of Israel. Unlike Israel, they’re prepared to fight on that front. But let’s forget for a moment about stationing Syrian or Lebanonese (read Hezbollah) troops on two fronts. Just imagine how much this is going to restrict, if not eliminate, Israel’s ability to respond. The IDF simply couldn’t take the chance of hitting a Jordanian soldier. All I can say is that this shows Olmert really cares. He simply doesn’t want the enemy Arab armies to have to traipse across the desert to reach our borders. He’s inviting them inside. The residents of the Negev have decided to unilaterally "break away" from the State of Israel in protest of the State's complete abandonment of them to enemy attacks. Their first steps include a tax strike. They plan to soon issue ID cards. My recommendation is they form an army. Israel has done it again. Teva announced the first drug ever found/created to help slow down the progression of Parkinson's disease. The drug is named AZILECT. Again Israel leads the way for helping cure the woes of the world. I wonder if everyone calling for the boycott of Israel and Israeli/Jewish products will boycott this drug too? The Kibbutzim around Gaza have prepared their evacuation plans in case the government decides to send the IDF to finally defend the country. While it's not a plan likely to be used, but it appears that retreat seems to be the theme running through this country's mind. Reports indicate that the government is seriously considering abandoning the Shebaa farms to the Hizbollah government. And of course, Olmert can't wait to dump the Golan in a fire sale. There is no country in the world that I am aware of that wants to abandon/dump/throw away territory. Not a single Arab state has ever abandoned claim to any grain of sand. Yet here is the State of Israel, just looking to do exactly that. (IsraelNN.com) A $5 million indoor playground will be built for Sderot children, the Jewish National Fund (JNF) has announced. The proposed 21,000-foot building will be the largest indoor playground in the country and will be fortified in an industrial area. It will include jungle gym equipment, soccer and volleyball courts, an area for watching movies and television, swings, a merry-go-round, gift and snack shops. The Rabbi of Ofra, Rabbi Avi Gisser has granted permission to the non-Jewish laborers to work within the town ON SHABBAT to finish up the houses there as soon as possible. He did this in response to the attacks by the Left to destroy the town by way of the Supreme Court (see my post on it here). He hopes to move the families in quickly and create facts on the ground (Please God). According to Haaretz, Chareidi MK Rabbi Avraham Ravitz (United Torah Judaism), says that sanctioning construction on Shabbat is misguided to say the least. "Purely from a halakhic standpoint, a Chinese laborer can work whenever he wants. If he chooses to do so on Shabbat, so long as it is not at my behest, a system of halakhic arguments can be found to permit it. I would not permit it, and in any case a rabbi should also take a long-term view: ? What will be the outcome of this? Tomorrow, someplace else, they will start allowing construction on Shabbat because perhaps some politician will wake up in the middle of the night [and call for] an armaments factory or textile plant that strengthens the state," Ravitz said. Opposing MK Rabbi Avraham Ravitz (United Torah Judaism) is the Gemorah. [Our authority further says that] "a field bought in Syria is like one bought on the outskirts of Jerusalem". What rule of conduct can be based on this? — R. Shesheth Says: It means that a contract for selling it [to a Jew] can be drawn up even on Sabbath. What? On Sabbath? — You know the dictum of Raba, "He tells a non-Jew to do it." So here, he tells a non-Jew to draw up the contract. And although there is a Rabbinical prohibition against telling a non-Jew to do things on Sabbath [which we may not do ourselves], where it was a question of furthering the [Jewish] settlement of Eretz Israel the Rabbis did not apply the prohibition. Hattip to Dr. J. Woolf (I was forwarded his comments on this matter). So, let's see if we got this right. 1. The Left is trying to destroy Ofra and hand the land over to enemy. 2. The Rabbi of Ofra uses the Gemorah that states that one is not prohibited from appointing a non-Jew to do certain labors on Shabbat specifically for the purpose of furthering the settlement and acquisition of the Land of Eretz Yisrael (where Eretz Yisrael is defined as Greater Israel including Syria). 3. Meanwhile the Chareidi MKs are against it because they can't seem to differentiate between expanding the ownership and liberation of the land of Eretz Yisrael with building industries that sit on already owned and liberated lands (and seem to be unfamiliar with this Gemorah, because it doesn't seem to be that a "system of halachic arguments" needs to be found, it's pretty clear from one explicit statement). 4. The "Settler Camp" is prepared to actually live and apply Halacha to building a modern Jewish Halachic State and discover halachic solutions to National problems. As usual, Moshe Feiglin makes it clear and right to the point. The above verse in this week's Torah portion holds all the elements that we need to fight the Kassams. But nothing in this verse exists today in Israel. That is why we cannot deal with our current security challenges. This is not a low-intensity conflict nor any other type of post-modern aphorism used to blur reality. When rockets and shells fall in Sderot and Kfar Aza, that means that we are at war. He who does not understand that he is at war cannot win. The simple and basic understanding that this is our land does not exist today. A government that does not internalize the fact that Gaza is an inseparable part of Israel cannot really fight there. It will necessarily be lured into policing operations. And when here or there it actually accomplishes something, it will immediately be at the receiving end of international condemnation - and justifiably so. If you have decided that you are a policeman, then don't expect the respect reserved for soldiers fighting a just battle. Third, "The adversary who oppresses you". There is a good side and an evil side in this story. It is not just a meaningless conflict. We represent good and our enemy represents bad. This is a war of the good against the bad. The destruction of evil is a lofty cause. This is not the war of survival of the browbeaten weakling gasping for just one more breath of life. It is the war of the Jewish Nation, fighting to realize its Divine destiny. Fourth, "Then you shall sound an alarm with the trumpets". The trumpets must also sound in the hearts of the residents of Tel Aviv. This is not the war of the outlying areas alone. Just like the siren sounded on Memorial Day that unites the entire nation around one issue, we must all unite around our common goal and destiny. Fifth, "Before G-d, your G-d". We have a G-d. We are empowered by an unquestionable moral force. We rely on our G-d while we prepare ourselves for war with the utmost military professionalism. We understand that it is not our might that brings us victory, but rather our faith and humility before G-d.
We pray that we will soon merit Jewish leadership that will build Israel's army on the above foundations and will restore Israel's security and national pride. This is a bit off-topic. I was reminiscing with someone about our army days and I recalled something that really hit me then. During tironut, I had gotten Shabbat on the base (first of many) while everyone else went home. I was mostly alone on the base with a guard shift here and there, but plenty of time to sleep and eat. Come Sunday, the buses came back with all my fellow trainees. As I’m watching the mifakdim run them from the bus to the wall and back, and to pick up their gear, and move their gear, and run to the bus and then to the tree and back, it really struck me. Their nearly 2 day break for Shabbat completely changed their mindset. On Friday morning everyone was a tough soldier following orders, while on Sunday morning no one was in the soldier mindset at all. While I didn’t do anything soldiery over Shabbat, I was still in soldier mode the entire time, but I could see that none of them were there yet. I decided to pay attention, and in fact, it took most of the day of being run around to the ground for my fellow trainees to get their soldier mindset going again. I found that to be an intriguing insight to be stored away. The CHE (Council of Higher Education) whose actions are morally supported by the radical leftist Yuli Tamir (Minister of Education and one of the founders Peace Now - an organization recently exposed for its massive international tax fraud) have decided that in their battle against the Ariel University Center (because of its location in Greater Israel), that they will not recognize any degrees from this esteemed institution. They've gone even beyond what the British academics have done to CHE recognized institutions. Trust the Israeli Left to take it further than our enemies. But hang on guys, elections are around the corner and Tamir will soon be out of a job. Elections are in the air! Nothing like elections to actually get the elected to start working. Finance Minister reports that he plans to implement a plan to gradually reduce taxes for the lower and middle class over the next 7 years. Sounds strangely like Netanyahu's plan before the previous elections. The Shai Dromi law (allowing homeowners to defend themselves with lethal force) just passed it's second reading. The Electric Company will allow homeowners to install Electrical Solar Systems in their homes and sell back electricity! This story sounds weird to me. I suspect the solar panels will probably have to be bought from and inspected by the IEC. Otherwise why would they agree to this? The Security Cabinet decided NOT to go and fight Gaza. Is the dollar on its way back up? After hitting rock bottom 10 days ago, it's gone up a few percents. Let's Pray. While the Israeli government never actually picked up on the concept of "reciprocity" when it came to treaty violations, at least one group in Israel has become as expert. Arutz-7 had an interesting article in the Hebrew paper this past Shabbat. It turns out that in nearly every case, whenever someone complained to the Israeli Police's complaint division (Machash) about a case of police violence, the police immediately opened an investigation against the complainer and charged them with violence against the police. Most cases against the police were then closed either due to "lack of evidence", or because multiple policemen would unite together in their testimony against the testimony of the victim. As Arutz-7 reported, this occurred with nearly every complaint that was opened! Yet another issue I've ignored is Obama. The other day he gave a speech at AIPAC that made me want to reexamine my opinion of the man. He later backed down and qualified his statements. I haven't really had time to discuss the whole Rabbi Druckman controversy and my opinion on it and the story behind it. I just want to mention that Chief Rabbi Amar is taking a strong stance on the matter and has announced that he will consider quiting his post if Rabbi Druckman is not reinstated and if the Religious Court does not back down from its pronouncement. I'm a big fan of Rabbi Amar, and he has been doing a lot to standardize the entire conversion process. I am glad he is taking such a strong and deliberate stance here on a issue that affects the lives of thousands of people. It's unusual as of late to see a public official taking a strong moral position and standing behing it. Now that it was disclosed that Shalom Achshav is an illegal organization that committed tax fraud on a massive level, they have decided to outsource their "legal" attacks on the Jewish communities. The leftist that ran the campaigns for Peace Now is now using 2 other organizations (Yesh Din and B'Tslem) to front his attacks. So as usual they ran to the High Court (which in of itself is interesting, because when you think about it, they really need to go to the police to open a criminal investigation for land theft, and if the police find wrongdoings, then it would go to a standard court). And while the residents of Ofra have all the documented proof that the land of Ofra was legally purchased and is theirs, the High Court tends to ignore any documentation as they lean to the extreme left when it comes to these attacks (even though it probably shouldn't be in their purview at all). Anyway, I haven't check it out yet, but we know that foreign governments are significant donors to Shalom Achshav. I wonder what foreign sources are supporting Yesh Din and B'Tselem - and personally question if as a result they should allowed any standing in the courts as they seem to be acting as a foreign government's local representatives. Wow! It was an exciting Shabbat in Chashmonaim (not that I was there). First the emergency beepers go off during davening, and finally the Kitat Konniut members actually get told to carry their weapons with their magazines. The local Arabs decided to escalate their protests and this time extended it to within the boundaries of the town along with their sling shots. There's no argument or disagreement that Naveed Haq killed one Jew and injured 5 others. There is no argument that he he yelled anti-Israeli and anti-Semitic sentiments as he mowed down the Jews at the Seattle Jewish Center. The only question apparently is whether or not he is insane - which is something that the jury couldn't agree on. What a joke! The Post's headline is "Eldad spared probe of 'treason' remark". I am sure that Eldad would have welcomed a probe. Perhaps he would have asked the investigators and the courts to explain to him on whom does the law apply, and on whom it doesn't. He would have said that he as a legislator wasn''t aware that the law was only selectively applicable. Or perhaps he would have asked when are you allowed to quote the law and when not. There is so much he would have required them to explain, if only they had followed through with a probe. I certainly would have wanted to hear those clarifications from those in charge. Like most of the Rapid Response Teams in the Judea region (not to mention other special security forces), I’ve done part of my training at the Caliber 3 shooting range in Gush Etzion. Let me tell you, compared to most IDF training bases, this place is heaven. Soda machines, bathrooms, running water, concrete floors, air conditioned classrooms, and ceiling netting (for shade on the range). You couldn’t ask for a nicer outdoor range. (And if you’ve only ever shot in an indoor range, you’re in for a surprise, it’s a completely different experience). Anyway, the owners of the Caliber 3 Shooting Range have opened a new introductory training program for the general public. They are offering a special 2 hour package for tourists visiting Israel (or you wanna-be settlers in Beit Shemesh). 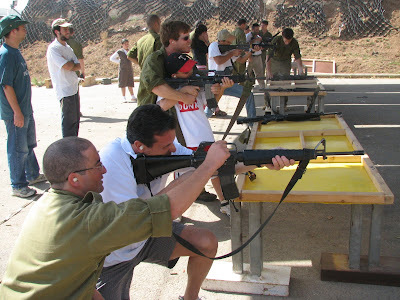 The package includes explanations of the security situations Israelis face, particularly in the settlements, discussions with counter-terrorism experts, examples of different counter-terrorist techniques, and of course the fun part - Shooting pistols and M-16s. The program is open to individuals, groups, and families. You can see from the photos on their site that everyone is having a great time. Of course they’re having a great time. They shooting M-16s and Glock pistols. 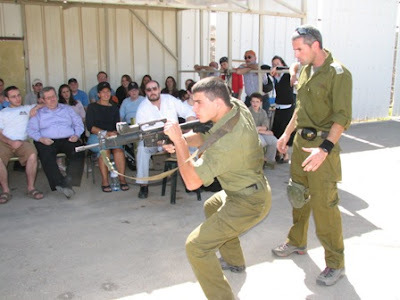 (All shooting is supervised by trained instructors, most are graduates of various special forces units). Why do you think half the people on the RRTs sign up in the first place? So head on over to the Caliber 3 website and learn first hand what it is like to protect a settlement and fight a terrorist. Today, Hizbollah (the Government of Lebanon), in an exchange, returned the remains of IDF soldiers killed in the Second Lebanon war. Until today, the Israeli government and IDF officially claimed, and parents were officially told that no remains were left in Lebanon, and any soldiers killed were retrieved whole. All this time Hizbollah has claimed they've been holding on to IDF soldier's body parts (probably eating them like the Palestinians in Gaza did at Rafah in May 2004). While I don't have a link on it, there was a big to-do by the parents of some of the soldiers immediately after the war when Nasrallah (you know what that means in Russian) said he had body parts. Some parents claimed that the army hadn't returned all their son's body parts, and others said they knew they hadn't but weren't going to make a big noise about it. So who did Hizbollah return? Friend Treppenwitz has an interesting post up on his blog related to Jerusalem Day (and the War of Independence). [In commemoration of "Yom Yerushalayim" (which begins this evening), it seems fitting that a story be shared… one of the lesser-known chapters in Jerusalem’s modern history. It is not a pretty story and lacks a happy ending… and it even reveals some of the ugly infighting that goes on to this day between the old-guard Israeli establishment and those who prefer to view Zionism through the lens of Jewish history. A part of me hesitates to share so ugly a story when the history we present to the world is usually so full of positive feats and miracles. But I feel like we owe it to the brave players of this story to share it and hopefully to take a lesson or two from it.